The forests of Dago, which is northeast of Bandung, may look just like any other regular forest to unsuspecting visitors, but the area is home to a series of tunnel networks made by the Dutch and Japanese. The Goa Belanda or Dutch Cave, is one such network which bears the namesake of its creators and was built in 1918 originally as a water tunnel meant for generating hydroelectric power. Coupled with the high precipitation of the area, the neighbouring mountain ridge - which stretched from east to west - acted as a natural watershed. The Dutch took advantage of this by digging a tunnel through a sandstone ridge near to the Cikapundung river and channeled its gushing waters through the tunnel, hence creating the first hydro-power plant in the Dutch East Indies, an amazing breakthrough for the colony. In 1941, as the threat of war loomed over the Asia Pacific, the Dutch chose to turn the hydro-power tunnel into a military base. This was a strategic move as the surrounding mountains and forests helped to protect the tunnel and keep its location a secret, while the tunnel was in close proximity to Bandung as well. The telecommunications station at Gunung (Mount) Malabar, located south of Bandung, was shifted entirely to the these tunnels as the former was prone to aerial raids. Apart from its primary role of transmitting radio signals, the tunnel network also contained sleeping quarters, ammunition storage, an armoury, interrogation rooms and even detention rooms for enemy troops! While the Goa Belanda isn't as elaborate or built on a scale as colossal as the Singapore's Battle Box, the underground command centre built under Fort Canning by the British, a walk through the intricate network of tunnels in the dark, aided only by torchlights, may prove to be a daunting task for most people. The former water tunnel, which is 144 metres long and 1.8 metres wide, was used as the main passageway which ran from one end of the ridge to the other. A pair of rails can be seen etched into this passageway shortly after entering the tunnel and they ran for two thirds of the entire tunnel length and were added to facilitate the movement of carts. From this main passageway, the Dutch extended the tunnel network by adding two more wide thoroughfares and fifteen intersecting passages. They also added two large iron gates at either end of the main tunnel which could be closed if necessary. The air inside the tunnels was damp and musty, but the cool mountain air made the walk a little more pleasant. I could only imagine how fetid the air inside these tunnels would have been during the war when it was fully operational. The soldiers were known to have stayed in the tunnels for the entire Dutch East Indies Campaign, which lasted for 4 months, without ever stepping outside. The eerie silence was broken by the echoes of our footsteps. As we trudged along the dark recesses of the tunnel, I understood from Hardi that some renovations were done by the government in 1985 in a bid to upkeep the place. Hardi also pointed out that some of the tunnel walls were repainted and look newer than their actual age. Hardi touching one of the stone-cold refurbished walls. Apart from being an important piece of Indonesia's colonial history, the Goa Belanda is also widely rumoured to be haunted. People have often complained of hearing strange sounds inside the cave, such as the sound of marching soldiers and unexplainable screaming. It is therefore no coincidence that the tunnels have been used regularly by producers of various reality shows in their bid to film and prove the existence of ghosts, including the hugely popular paranormal documentary - Dunia Lain (roughly translated as "The Other World"). One of the lamps left behind by the Dutch. A popular myth also suggests that one should not mention the word Lada ("spicy" in the Sundanese language - the Sundanese people reside in large numbers in West Java, especially Bandung, the capital of West Java province) in the vicinity as bad luck would befall whoever utters those words. (incidentally, Lada means pepper in Indonesian / Malay). When questioned about this, one of the stern-faced guards outside the park solemnly replies: "We believe that there is a curse left behind by an ancient person who goes by that name and used to live in a village among these forests. Anyway it is taboo to mention that word, please refrain from doing so." Note the peculiar device on the left. Continuing our trek further into the tunnels, Hardi and I came across a interesting contraption in one of the passageways. Apart from the brackets which lined the walls of almost every tunnel, this passage had two large brackets mounted on a niche with a lever below. Was this a junction box or power device of some sort, which could be activated by pulling the lever? Further in, I came across another interesting passage which had an iron valance affixed to the frame of its entrances on both sides. A peephole in the middle of the valance allowed one to view of the interior of this bunker and the remains of the door frame below suggests that there was a large iron gate below. Was this the place where they impounded POWs? 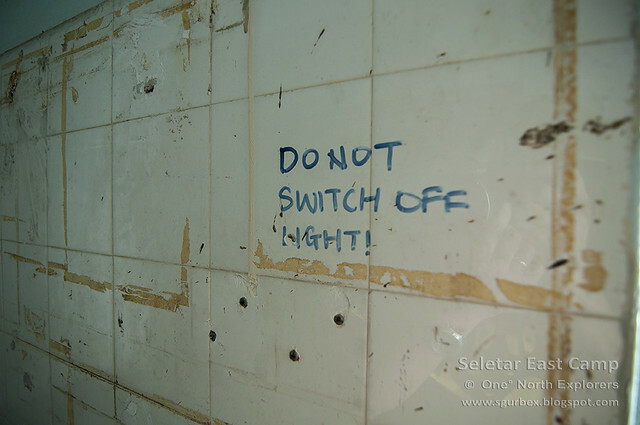 The bunker was empty, and this gave no indication of the activities which took place in here during the war. Metal brackets ran along one of the walls just like the others, and my mind suddenly ran the wild thought of Japanese POWs committing seppuku to die an honourable death rather than being confined by their enemies in this dark carrel. We were nearing the other end of the tunnel, where one could walk for about 5 kilometres to the famous Curug Omas waterfall, or hop on an ojek (motorcycle-taxi) for a less tiring experience, when we stumbled upon a curious sight - a hole in the wall! Interior of the "POW prison"
"What do you think was in this bunker?" I asked Hardi. "I'm not sure, but it must be something important for someone to have sealed it up." he replied. The Japanese Cave is the first cave you come to after walking some 300 meters from the main gate of the Juanda Forest Park. Left over from World War II, the Japanese Cave is tangible proof of how hundreds of Indonesians were forced to build the cave under the Japanese forced-labor system called romusha. Built in 1942 during the Japanese occupation of Indonesia, the Japanese Cave was used by Japanese troops as a defense shelter from the attacks of the Allied Forces. To enter the cave, you’ll need to rent a spotlight and ask for a guide’s assistance as it’s very dark inside the cave (that’s right, there are no lamps inside! ), so you might get lost in there. Renting a spotlight will cost you Rp 3,000; you can pay the guide as much as you please. The guide will also regale you with stories about the cave during your tour in the darkness. Any guide you meet there will tell you the same story about how hundreds of Indonesians died when being forced to dig into the hills to build the cave. At that time, the laborers were paid just five cents and a quarter cup of rice every day. Another story you might hear from the guides there is that the Japanese Cave was used as the film set for the 1970s movie Si Buta dari Gua Hantu (The Blind Man from the Ghost Cave). During the tour inside the cave, your guide will explain that the Japanese Cave has four passageways, each some 200 meters long each. Of the four passageways, the second and third ones were prepared as traps for enemies. Inside the cave, there are 18 bunkers, all of which have different functions, including as a surveillance room, shooting room, meeting room, munitions storeroom and kitchen. The cave has walls made of concrete, cement and padas (rocks made of layers of hardened soil) 50 to 70 centimeters thick. The construction of this cave, however, was not completed at the time Japan surrendered in August 1945, and has remained as it is ever since. 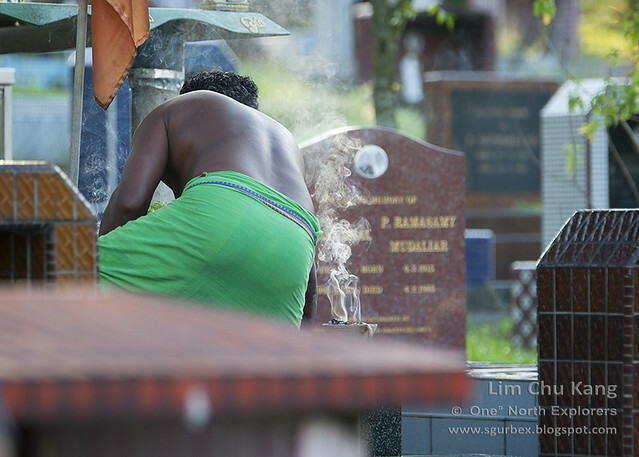 Unbeknownst to most, the Hindus of Singapore observe something similar to the Chinese 'Qing Ming' Festival, where family graves are venerated and cleaned annually. 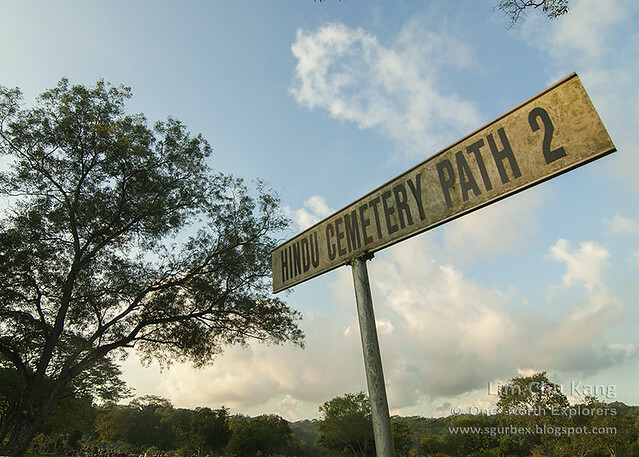 The Hindu Day of Remembrance takes place on the sunday before Deepavali and Indians can be seen visiting Lim Chu Kang Cemetery to pay respects and place offerings such as fruits, flowers and Indian confectionaries on their ancestors’ tombs. They will also light oil lamps and place incenses in burners around the tomb as a mark of respect while they remember the faithful departed. Hindu Indians are traditionally cremated within the day of death in India so it is rather uncommon for their deceased to be buried in a grave unless they were wealthy. However, it seems that several Straits Indians in both Singapore and Malaysia have chosen to bury the dead over cremation. 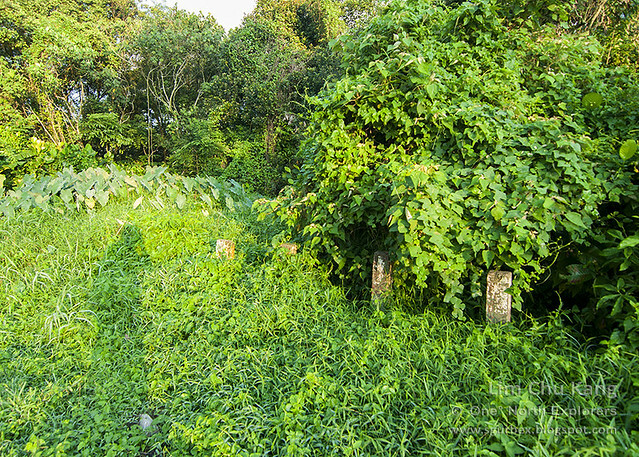 The Lim Chu Kang Hindu Cemetery takes up one of the smallest plots of land in the area. However, a peculiar sight awaits those who make their way up a small knoll overlooking the numerous rows of old gravestones. As you tread up a narrow path, flanked by the neat arrangement of graves on one side, the small but conspicuous shrine presents itself. This curious looking tree stump would give goose pimples to most at first sight. 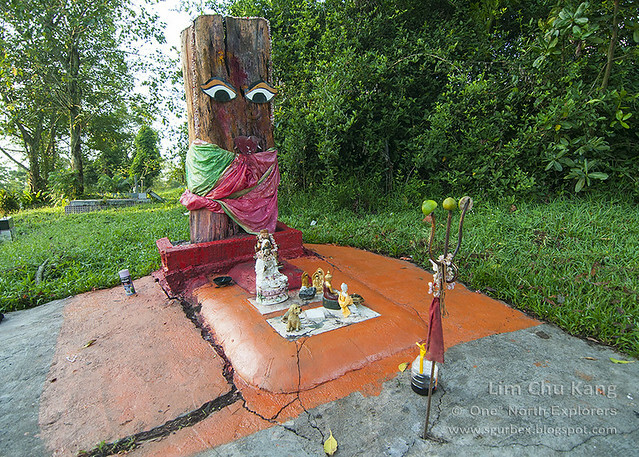 After asking some of the Indians who were offering their respects to a grave nearby, I found out that this was a shrine devoted to worshiping the Hindu goddess Kali, who is also known as the Goddess of death, destruction, and sacrifice. As if a nod to Singapore's identity as a melting pot of cultures, there was a motley mixture of several Buddhist & Taoist deity idols, in addition to a small figurine of a dog (left here in jest?) placed before the tree stump. There was also an orange box painted around the shrine, as if to demarcate the sacred ground on which the shrine stood. 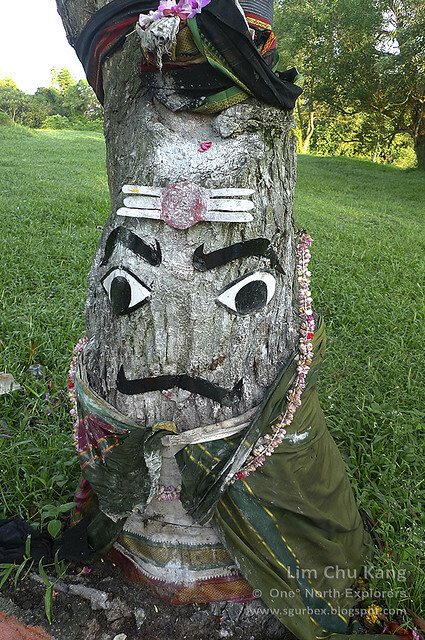 A second tree nearby was marked in similar fashion and adorned with a flower garland to worship Shiva, the husband of Kali and one of the main deities of Hinduism. A trident, the weapon of Shiva and also a representation of Muneeswaran, one of Shiva's many forms, protruded out from the concrete floor before front of both shrines. (There are a few temples devoted to Muneeswaran in Singapore and Malaysia). 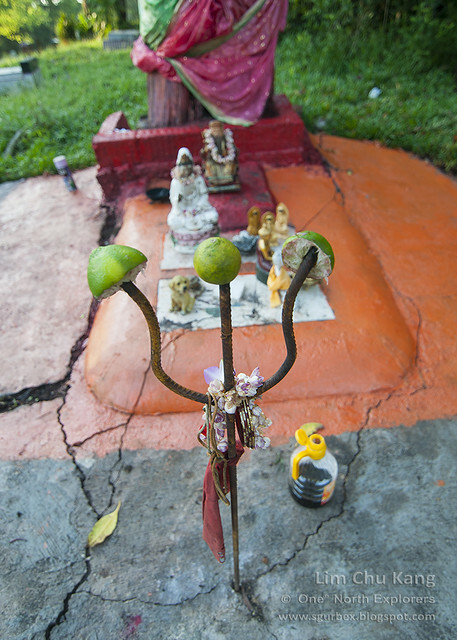 We found limes with some red saffron powder placed upon each of the pointed ends on the trident before Kali. Hindus believe that limes have the ability to absorb negative energy and transfer it away from the devotee. It is also usually offered to more fierce or protective forms of Kali and it is not uncommon to find lime combined with Indian chili to make a protective charm to repel the evil eye. What are the purpose of such shrines in these macabre surroundings? According to the teachings of Hinduism, a certain form of both Shiva and Kali live in cremation grounds or cemeteries. Known respectively as 'Shmashana Adhipati' and 'Shmashana Kali' (a 'shmashan' is a Hindu cremation ground), the pair of deities are known to ward off evil spirits lurking in the vicinity. Hence, most Hindus will pray at these shrines while visiting the tombs of their ancestors. As we went closer, it was evident that the trunk of the Shiva shrine had been liberally slathered with vibhuti, a thick white ash made from a special kind of burnt wood. Shiva is often depicted with his body is covered with fresh ash from the cremation ground, the ash itself being a symbol of death, regeneration and change. There was also a tripunda (literally "three marks" in Sanskrit) embellishment , a holy symbol attached to the 'forehead' area of the face on the tree trunk. Earth dug up from a recent fresh burial. As I took a leisurely walk among the myriad of tombstones, I found solace in the tranquility of Lim Chu Kang. This was an area where most city dwellers would avoid like the plague, except for remembrance services. The absence of people allowed me to soak in the beauty of Mother Nature I trudged along the dew soaked grass while birds fluttered and sang in the trees around the cemetery. Concrete bollards along the tree line, possibly blocking access to the steep drop at the edge of the cemetery. An inescapable part of the cycle of life, people generally confront death only when they are forced to do so. For most, it remains safely hidden away until it ultimately appears, seemingly out of nowhere. 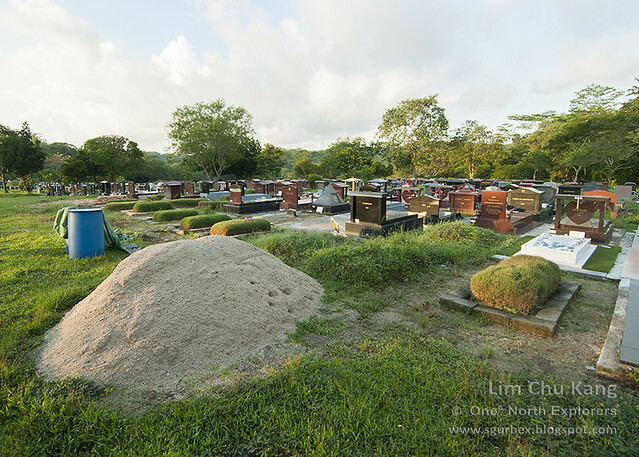 For the grave diggers and cemetery workers of Lim Chu Kang, there is nothing ghastly or morbid about the atmosphere of the cemetery. For them, the cruel reality of death is just another day on the job, toiling under the hot tropical sun. "For a long time, the Orang Seletar had lived a nomadic live in the mangrove swamps on the river banks found on both sides of the Johor Straits. One group lived on Pulau Belungkor, an island off the coast of Tanjung Surat, located at the mouth of the Johor River. This group would move over to the Seletar area of Singapore during October and November to avoid the strong wind that blew during those months. Until the 1920s, it was very easy to find Orang Seletar on Seletar Island and the neighbouring mangroves in the straits between Singapore and Johor." - Tribal Communities in the Malay World. 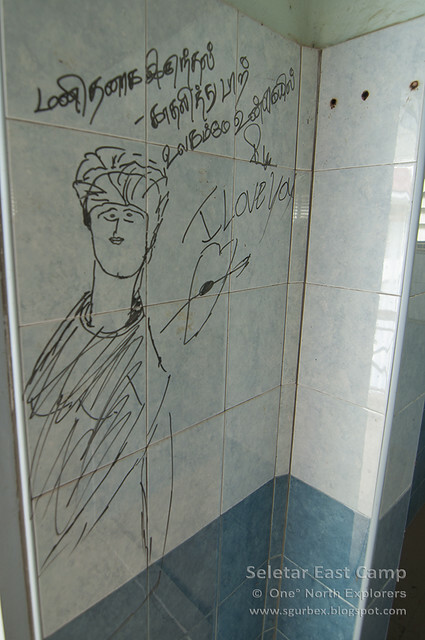 Historical, Cultural and Social Perspectives. Geoffrey Benjamin and Cynthia Chou. Publication Year: 2002. A keen sense of nostalgia overcame me as I drove through the familiar streets of what was once known as Seletar West Camp. If you had spent part of your national service here, names like Old Birdcage Walk, St Martin Lane and Piccadilly would definitely ring a bell. I was one of the wide-eyed soldiers who was posted to Seletar Camp before the turn of the century and I still remember reporting to the ramshackle cantonment along Jalan Minyak known as the Supply and Transport Training School or ‘STTS’ as it was widely known. Former trainees and permstaff would remember the old single storey buildings that looked suspiciously prone to giving way in a heavy thunderstorm, the fleet of cantankerous Fiat 3 tonners and the tarmac driveway which doubled up as a parade square for those dreadful defaulters’ parades. They would also recall the scenes of Encik Krishnan’s pet Jack Russell terrier running around the evergreen lawns and the booming voice of Warrant Vennu, which struck fear into even the most intrepid soldier. And of course, who could forget the piping hot prata at Jalan Kayu? 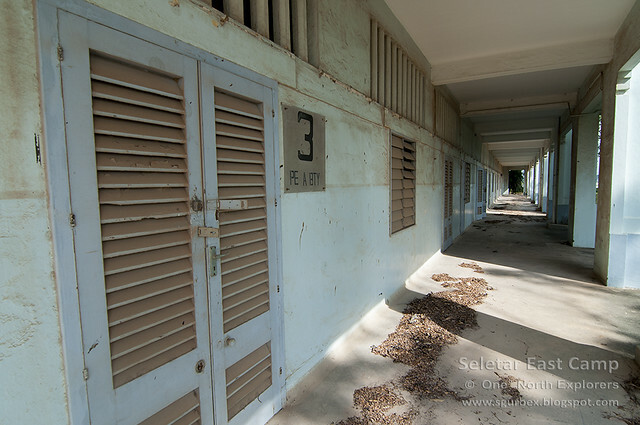 Block 450, a former barracks for both the RAF and SAF in Seletar East Camp. 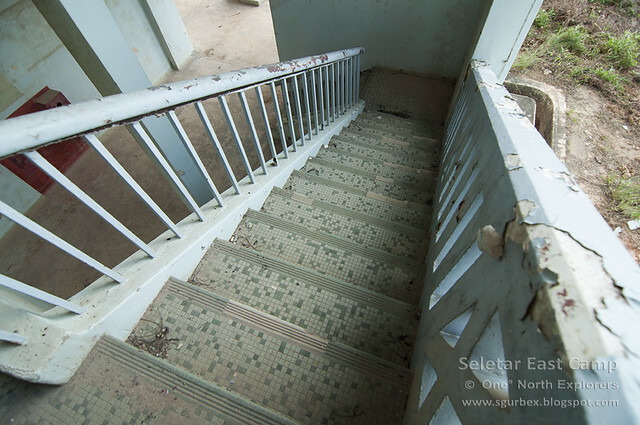 Once home to the largest British Royal Air Force (RAF) base in the Far East, Seletar Camp is home to several colonial buildings, many of which were taken over by the Singapore Armed Forces when they moved into the premises in 1971. 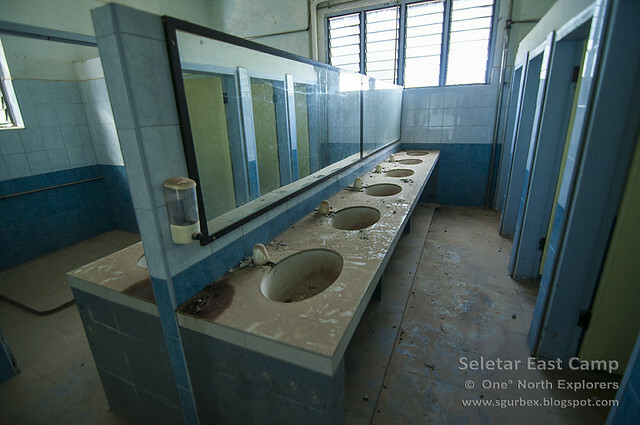 It was home to the Malayan Air Training Corps' Jalan Kayu School, where the corps would conduct their training and annual camps in the 1950s and 1960s. There was also a cycling grand prix which was held on the camp's cycling circuit in the late 1950s and an auto club known as the RAF Seletar Auto Club. 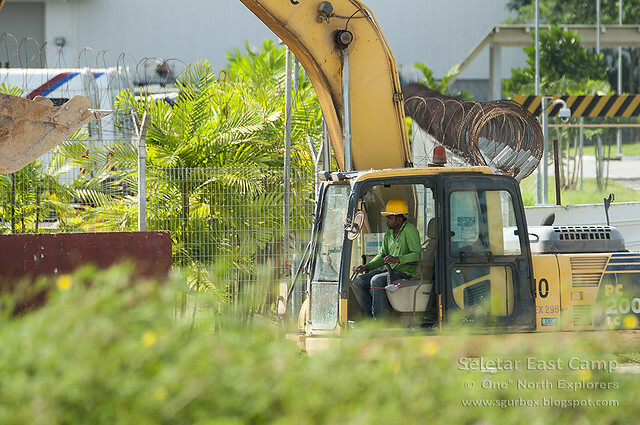 Today, the actual military camp takes up only a small area within Seletar, with several dump trucks plying the swanky Seletar Aerospace Way, which didn't exist until recently, ferrying materials for a new road network that will serve the $60 billion Seletar Aerospace Park. The 320 hectare park is developed by JTC Corporation and it is presently moving into its final project phase, which will entirely completed by 2018. Construction work going on around the former West Camp area. One peculiar thing about the camp would be how military life always intertwined with that of the civilians who lived and worked there; while the camp was mostly occupied by the SAF, there were close to 400 black and white bungalows – originally built to house officers from Britain's Royal Air Force – within the camp which were rented out to the public at a (hefty) fee of six thousand dollars a month, according to one resident. Since the start of the aerospace Park project in 2006, this number has been reduced to 130 with the remaining residential colonial bungalows all located outside the aerospace park zone. 'Singapore' sticker commonly found on food aid packages given out in disaster relief missions. In 1923, the British government acquired the 600 acre site from Singapore United Rubber Plantations Limited before they turned it into what would be the largest RAF station in the Far East. It is hard to imagine that the landscape of Seletar was once that of mangrove swamps and undulating with rows of coconut and rubber trees. The site was then cleared over the next five years by thousands of labourers including the ‘Concrete Lizzies’, a term coined by the British to describe the resolute Samsui women of Singapore. The RAF began operations in Seletar in 1928 and the area also served as Singapore’s first civil airport before the completion of Kallang Airport in 1937. 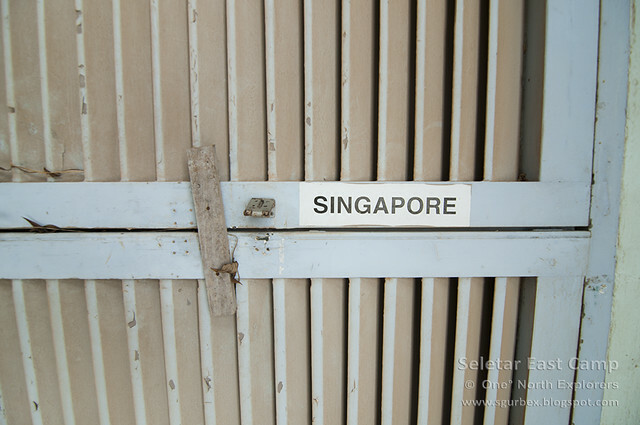 Apart from STTS, Seletar was also home to a few other SAF units like the School of Logistics (SOL), 18th Singapore Air Defence Artillery (SADA), the Seletar East Ammo Dump (SEAD) and the 35th and 39th battalion as well as HQ ARMCEG of the Singapore Combat Engineers (SCE). Following the deracination of the rest, the Combat Engineers seem to have taken over what’s left of Seletar East Camp while the Aerospace Park takes up the most of the former West Camp. With the receding camp boundary pushed back past Saint Martin Lane, a handful of former military buildings now lie outside military jurisdiction like the retrolicious Blk 398 Canteen, former Camp Commandant Office (CCO), Block 179, which was the Station Headquarters of the RAF, as well as Block 450, a 3-storey barracks used as accommodation for military personnel from both the RAF and later, the SAF. The latter two were gazetted to be conserved by the URA in June 2014 together with 32 asymmetrical black and white bungalows clustered around The Oval off nearby Hyde Park Gate. 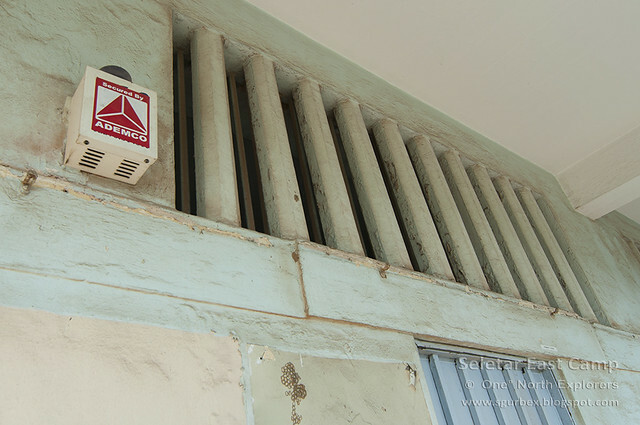 Measuring about 90 metres lengthwise, Blk 450 was one of several significantly large buildings bearing the same Art Deco design with 2 service blocks attached on either side in Seletar. 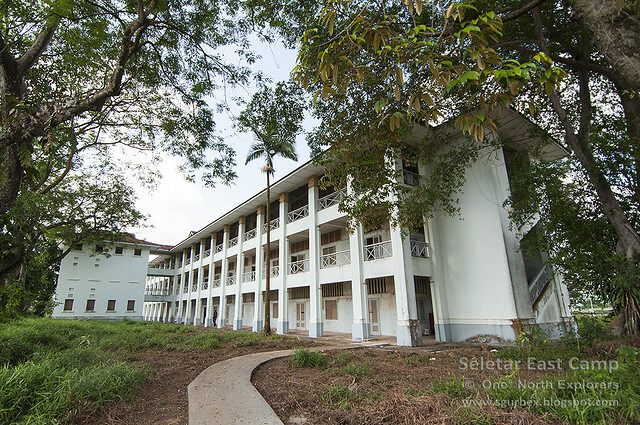 The building was one of the first few that were constructed with reinforced concrete and its long covered verandahs are a common feature of tropical colonial buildings, a measure to countervail the sweltering heat. 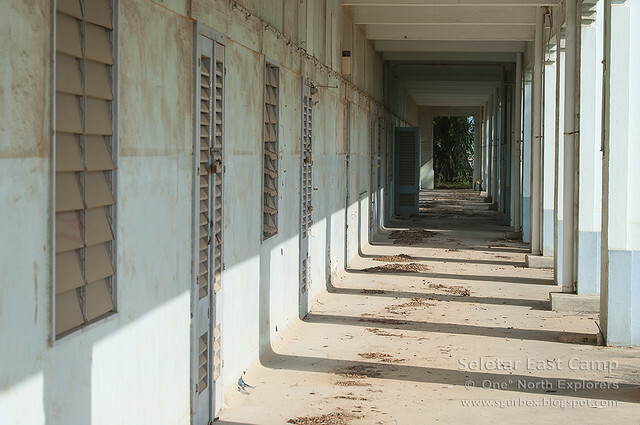 Based on the remnants of the standing orders plastered along the columns of the verandahs, the barracks were home most recently to soldiers from HQ ARMCEG (Army Combat Engineers Group), which had since shifted further north into Seletar East Camp. One of my friends, who spent time as a Bridging Pioneer Commander trainee here, tells me that it was one of the most punishing days of his NS life. Boot scraper built by the British. 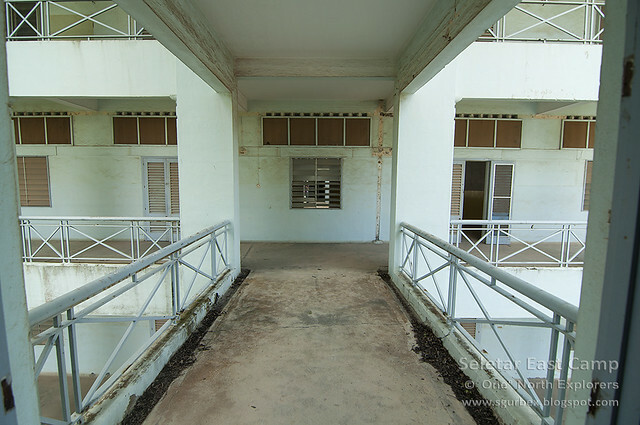 The barracks were laid out in a rather standard format with offices (called company lines in the SAF) on the first floor while the bunks were located on the second and third floor. The old timber doors and window louvre frames were still largely intact and used up until the time the building was vacated, though some of them had fallen victim to termites. I was fascinated by the perfect symmetry of the pre-cast concrete vents above the rooms. 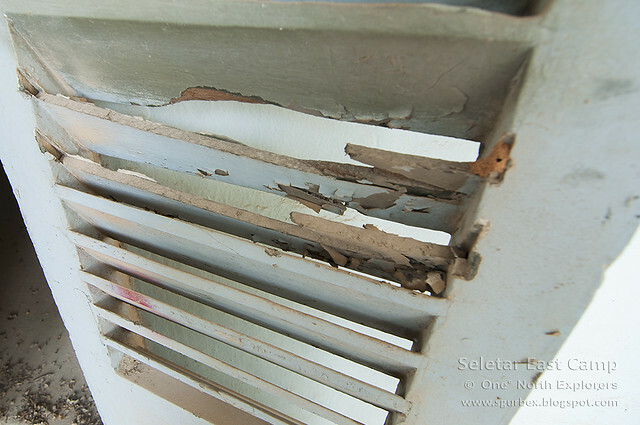 The British did always struggle with our immense heat and humidity and the design of the vents allowed the hot rising air to escape, especially important during a time where there were no air conditioners. Another interesting thing would be the floors of this building - The rooms and long verandah were screeded with concrete but the stairs were decorated with beautiful mosaic pieces. While it wasn't hard to notice these, I'm sure that the former residents wouldn't have stopped to appreciate these details, especially so when they had to rush down to 'fall in' with their superiors breathing down their necks. 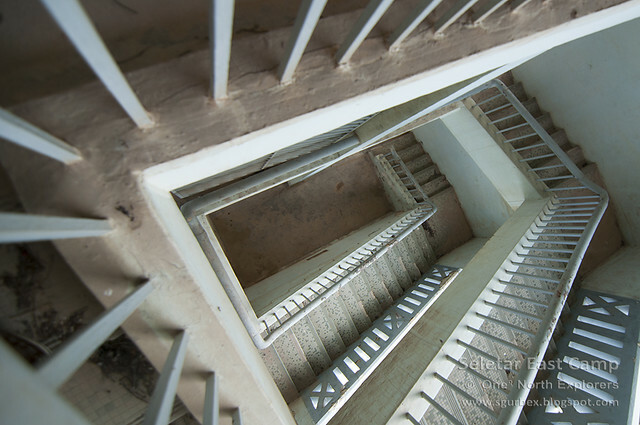 We found two rooms with had heavy steels within the same building; one was located on the ground floor while the other was situated on the second level of one of the service blocks. 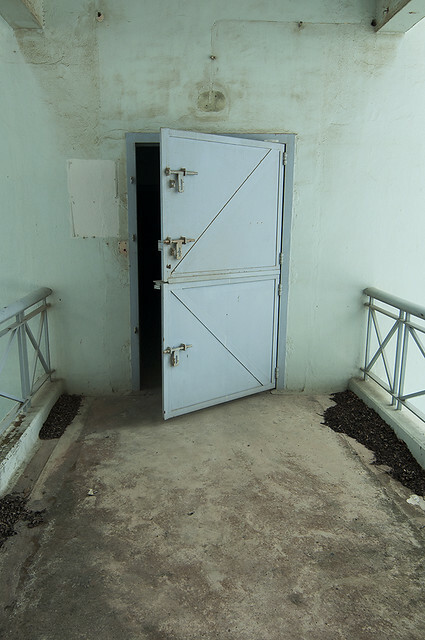 These heavily fortified rooms are normally used for the company armskote, where rifles and other weapons are stored. Singaporean sons would definitely remember those long loathsome nights cleaning their weapons outside their respective armskotes after coming back from night range, especially so if they had a 'neow' (difficult / calculative) armskote specialist! While the room on the ground floor had an intruder alarm, the one on the second floor had none. Hence, it is very likely that the armskote was located in the room on the ground floor, while the fortified room in the service block could have been used to store other (costly) operational essential equipment such as optical and signals equipment. The bunks were empty and quite similar to what we found in other military quarters such as the Command House at Fairy Point (also known to many as the Old Commando Barracks).However, I'm quite certain that these old walls have seen many a soldier getting punished after an unsatisfactory 'area cleaning' or 'stand by bed' inspection. As with other army camps, there is an abundance of stories from Seletar depicting encounters of the third kind. Reservists would always wonder why certain old blocks had wooden lumbers nailed into their doors and windows, with some forming the shape of the letter X. While I suppose that was done to simply prevent unwanted access, I'm certain that it has given much fuel for discussion of supernatural theories amongst groups of bored NS Men attending their annual in-camp training. 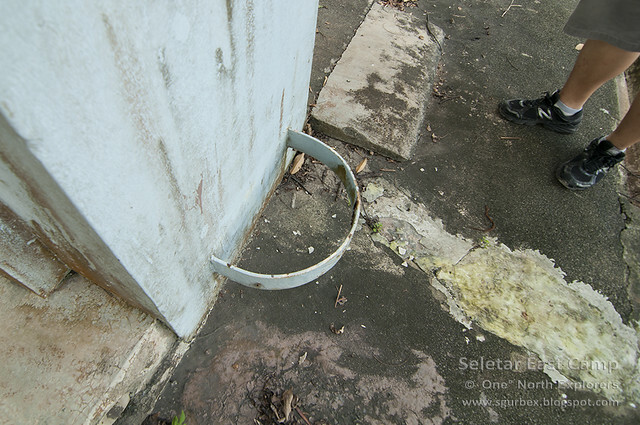 Before Seletar West Link was built, it was only possible to enter the back of Seletar West Camp from Seletar Club Road, a small, unlit road which ran outside the fence of the camp. This road will be familiar to those living in Yishun as the nearby Yishun Dam comes alive after nightfall with droves of modified street cars and their blinking lights and loud music. Motorists who elected to use that road to enter the camp after dark reported sightings of an old cyclist; they would see the back of the man riding on his bicycle as they approached him while driving towards the camp. While passing him, they will notice that he had no face! I also heard through the grapevine that there were several sightings around the Rolls-Royce facility when it was newly constructed within the aerospace park; the management had trouble hiring security to work there as people kept seeing and hearing things taunting them from the fenceline and CCTV feed. Mind you, this was before the aerospace park became more occupied like today. Sightings of white figures, lights appearing in unoccupied areas and hearing dogs howling in the distance were also ubiquitous amongst army boys serving their NS in Seletar Camp, although the civilian residents would beg to differ. 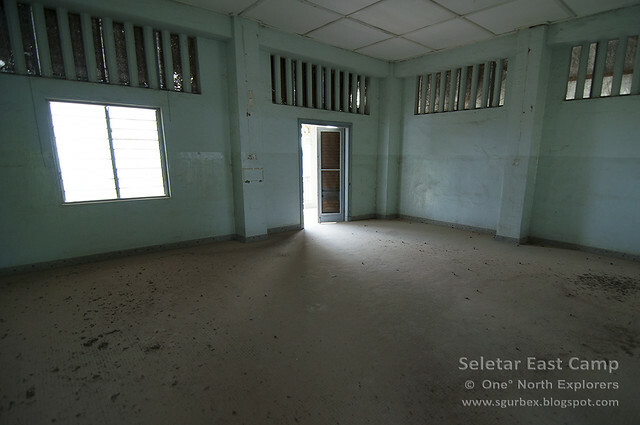 If you were a former soldier or resident of Seletar, I'm sure you'd have more stories or information to share. We'd love to hear them! Please post a comment below or reach us at sgurbex@gmail.com. 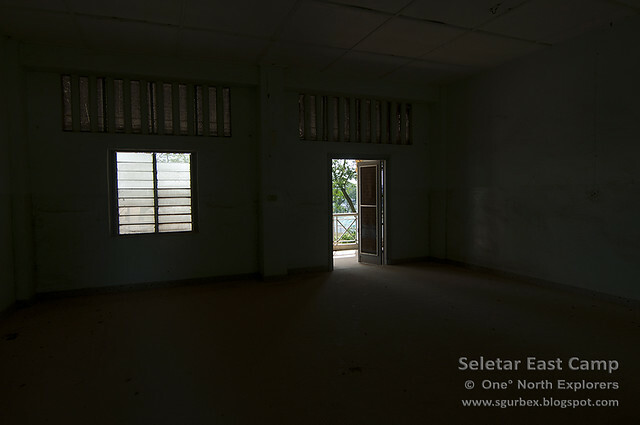 You can find more photos of my Seletar exploration in my Flickr album. Translation: "When you are a human, try being in love. You'll conquer the world. I LOVE YOU".